Egg tray mold plays a key role in a pulp molding production line. It decides the specification and the category of a production line. 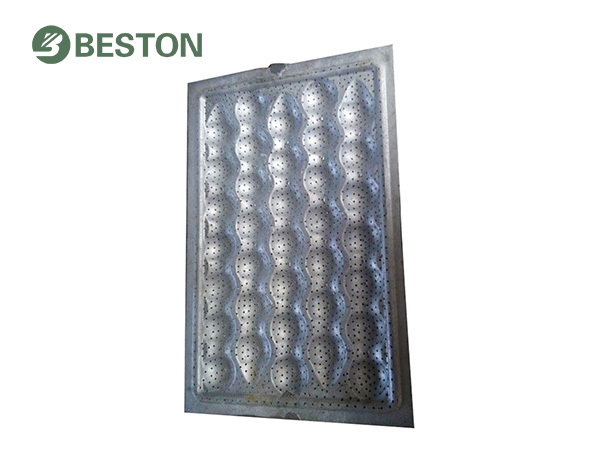 It is certainly the focus of each paper egg tray machine supplier, Beston Machinery included. With our professional design team, we have produced various pulp molding equipment with different capacities. In recent years, our high-quality products are widely exported all over the world and highly commended by our clients. We are sincerely expecting to provide the most suitable investment solution for more customers. The most common molding die is the egg tray mold, which is the key part of an egg tray making machine. With the increasing requirements of pulp molded products, we also design molds for egg cartons, shoe trays, fruit trays, seedling trays. On this basis, we have exploited different pulp molding production line in succession. Contact us now! We Beston will provide more than you expect. Remarks: 1.We figure out these parameters above on the basis of egg trays of 0.1 kg. 2. 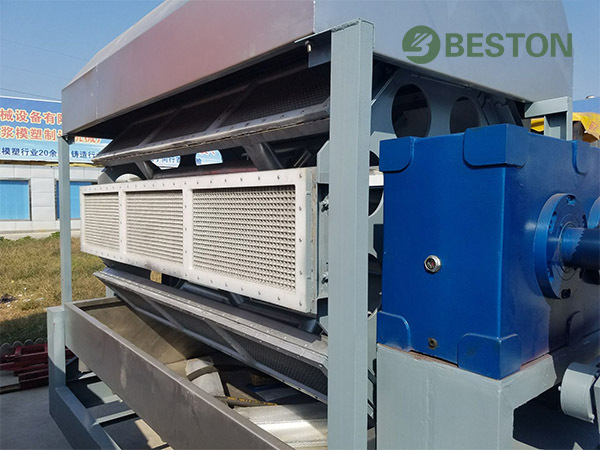 The differences of the same model mainly have to do with drying system. There are two kinds of molds, forming mold and transfer mold. The former one is used to mold the paper pulp into products, while the latter is applied to demold the products. The forming mold and transfer mold are of a perfectly concave-convex design. The inventive design is beneficial to protecting the molded pulp products. In order to meet the needs of customers, we have designed a variety of molding dies. On this basis, we have also produced a multipurpose pulp forming machine with demountable molding dies. The improvement makes a great difference to decrease the investment costs. That’s why our products are more well-received by customers. As for disposable tableware, the shape is simple to design. While the industrial packaging is required to fit the products closely and accurately. We have the best designers to overcome the difficult task. Diversity in number and design. Our company has formed multifarious pulp molding equipment at various specifications. Moreover, the capacity and the design can be adjusted according to the requirements of clients. Beston Machinery always does more than you expected. Beston supplies various pulp moulding machines for sale! As it is termed, pulp molding is to shape paper pulp up based on the molding dies. Thus, egg tray mold is considered as the core part of pulp molding technology. It is no exaggeration to say that the molding dies can directly reflect the technical level of a pulp molding machine manufacturer. Egg tray machine is applied to manufacture molded pulp products with scrap paper as raw materials through several procedures. The same paper pulp can be made into different products, such as egg trays, fruit trays, shoe trays. Based on the design of egg tray mold, we have built different kinds of pulp molding production lines, such as egg carton making machine, seedling tray making machine. Therefore, the molding dies make a great difference in the category of a production line. Besides, the equipment used in the packing system will be different with the different quality requirements of molded pulp products. The difference is also caused by molding dies. In addition to the shape, it also greatly influences the output of a production line and quality of products. For example, Beston Machinery has developed a series of paper pulp tray molding equipment at different specifications, namely, single-sided, four-sided, eight-sided and twelve-sided rotary molding machine. We provide 3 to 6 molding dies for each side. That is to say, the number of egg tray mold employed by our pulp molding machine is from 3 to 72. It clearly explains why the hourly yield ranges from 1000 to 9000 pieces. Furthermore, the number of molding dies affects the scale and the occupied area of a factory. On the other hand, the design of molding dies also has an influence on the quality of products, like the width of the edge, the space between grooves, the depth of the groove, etc. We have the most professional designers to optimize each detail to satisfy the demands of customers. It is convinced that you will get a high return on investing in an egg tray machine. 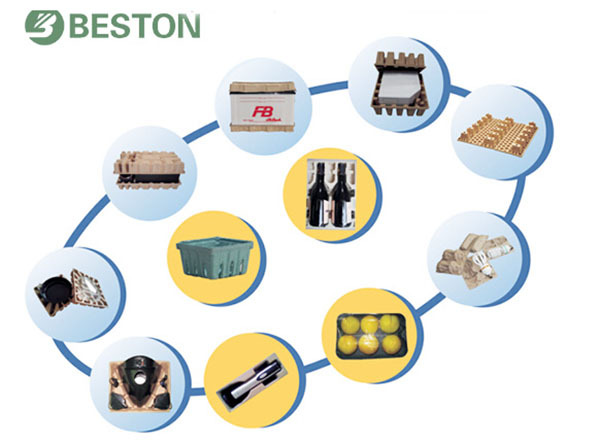 Beston provides the top-quality products and full service! As we know, each system of a pulp molding production line interacts each other closely. We have different appliances according to the output of egg tray machines. 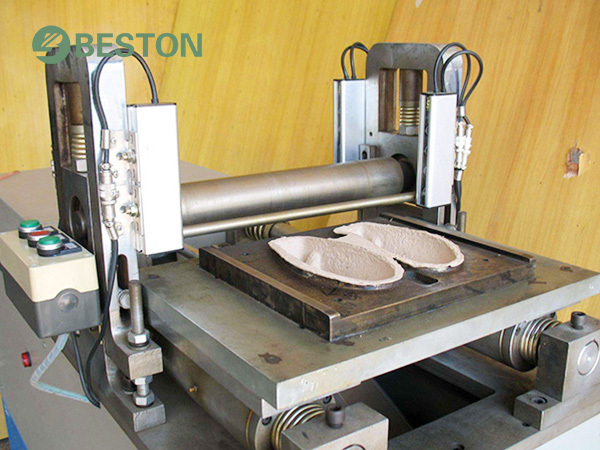 For instance, natural drying is often employed by small egg tray machine, such as BTF-1000 and BTF-1500. However, it is wholly unsuited for BTF-5-12. And the integrated pulping system is also favorable for small-scale investors to save more space. Moreover, we need more than one stirred tanks for large-scale egg tray making machine, such as BTF-4-8. However, we will provide you with the optimal solution according to your requirement. What you need to do is to contact us right now! Beston (Henan) Machinery Co., Ltd.